While I still have some questions about the quality of the flight model in this beta version, there are a number of other aspects of the simulation that make healthy strides towards realism. 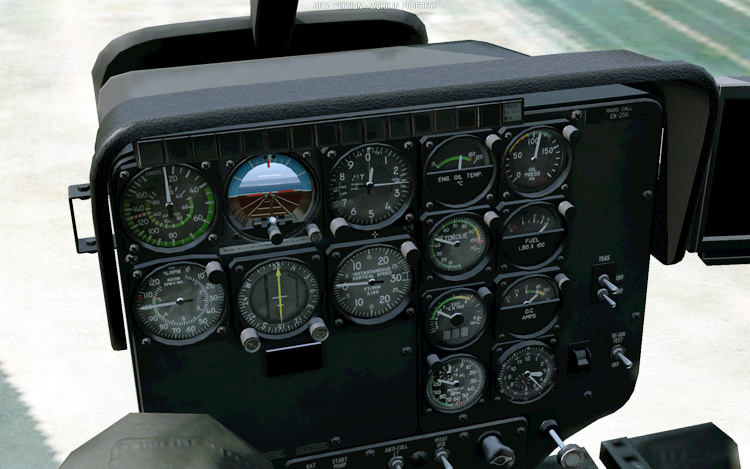 The cockpit gauges all appear to work and read realistic values, although some gauges, like the torque meter, may suffer from time to time due to not-quite-right physics models. 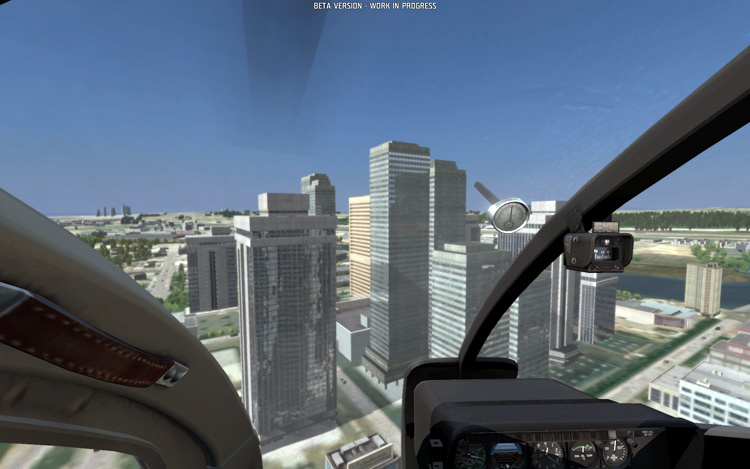 Pilots can start their helos on the ground and walk through a more-or-less realistic startup sequence: there are battery switches to flip, starters to engage, and throttles to adjust, although this version only implements an automatically governed throttle. This is a welcome feature compared to the all too popular one-button start method (which is still available for you “stick and rudder” folks out there). A panel full of working gauges, yes! 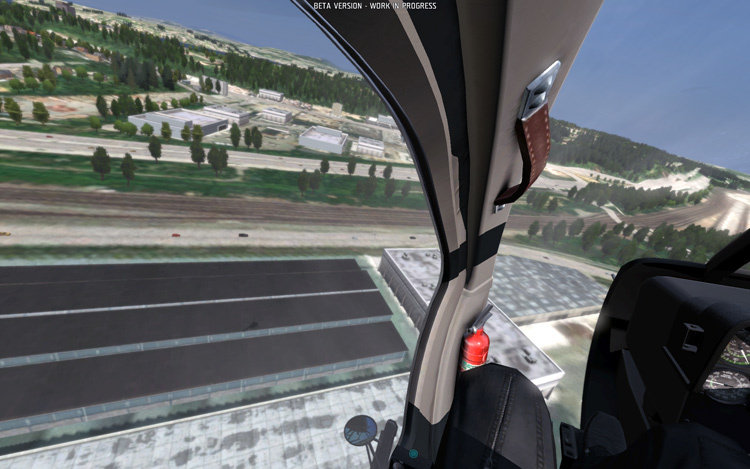 Sounds are an important part of any immersion environment, and this is another area where the beta falls a bit short: engine and rotor noises are constant during the flight, regardless of aerodynamic or engine loading. There’s no rotor flapping when the disc is unloaded, no engine straining when yanking on the collective. Unbelievably, you can actually hear birds singing while inside the cockpit, and engine noises from helicopters hundreds of meters away. 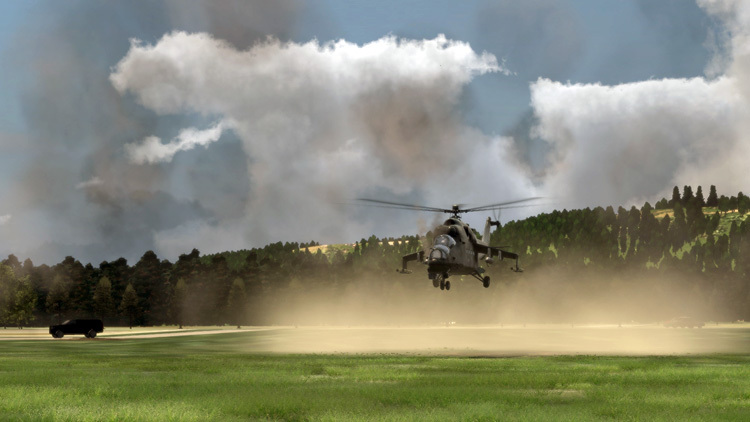 Graphics are a mixed bag: the helicopters are exquisitely detailed, inside and out, and the attention to detail is commendable. The instrument panels are fully stocked with working and accurately rendered gauges, the cockpit controls move in real-time, the in-cockpit shadows are the best I’ve ever seen in a flight sim, and that’s just inside the helo. The exterior models are gorgeously detailed: navigation lights, access panels, flush-air intakes, specular reflections, rivet lines… more bling than one should rightfully expect from a high fidelity sim. 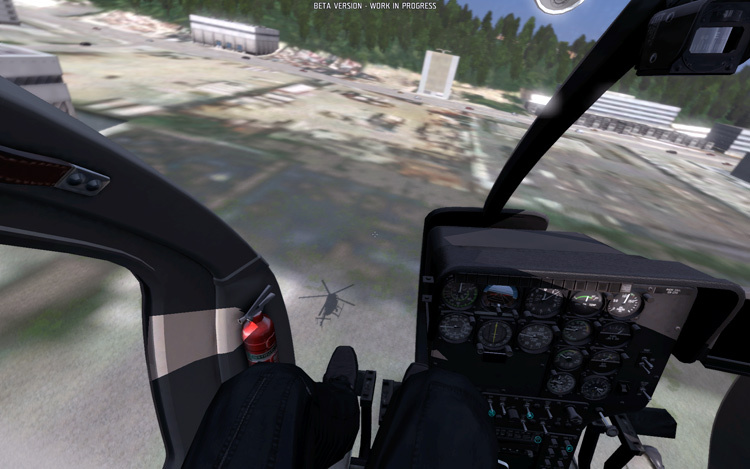 As you step away from the helicopter, however, and the attention to detail rapidly falls off. The terrain is mapped to an appropriate level of topographical detail, but the ground textures are low resolution and become a bit of an eyesore close up. Automobile traffic is modeled, but consists of a bunch of blocks with low resolution textures popping in and out of existence on low res street (or is that a field?) textures. Some of the larger buildings have mirror finish windows, which is a nice touch, and it’s impossible to fly near a cluster without an overwhelming urge to dart in between them. Closely spaced buildings beg for fly-bys. 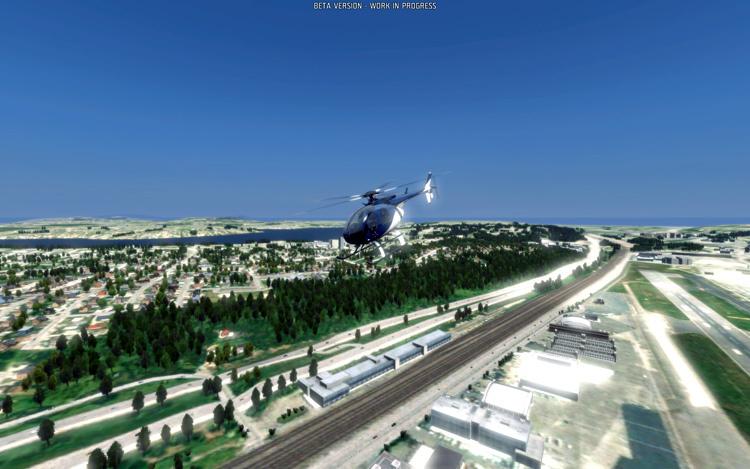 The helo’s shadow is rendered quite well on both terrain and buildings. All the eye-candy and updated physics models did effect my PC’s performance (see my specs below), but I was able to maintain a steady 20+ frames per second for the entire duration of my flights. My flight experience was also completely free of any CTDs or graphics glitches, which is quite a feat for any beta product. 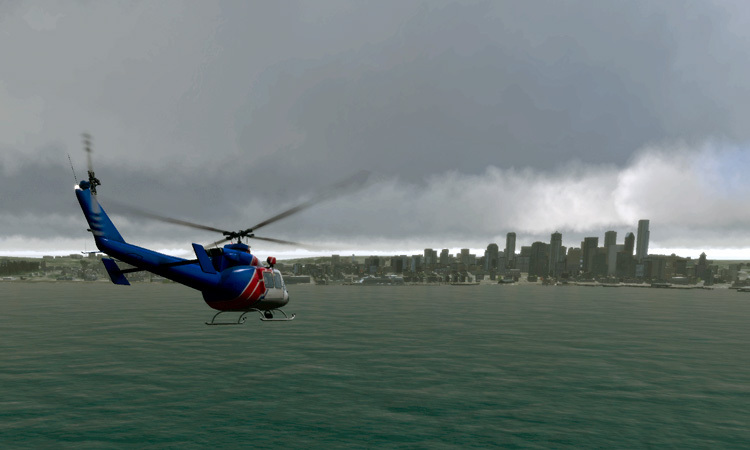 Overall, I enjoyed my time in the sim, cruising between Seattle and Bremerton, hovering alongside the shipyard, ogling the clouds and distant skylines, but occasional quirks of the flight model would interrupt the otherwise seamless experience. For a product that claims to have an “authentic” and “high fidelity” physics model, there is still a ways to go. 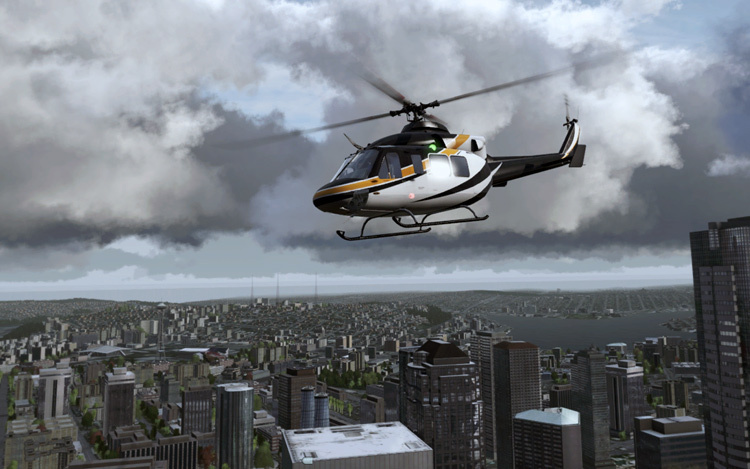 As an avid fan of high-fidelity simulations, I’m looking forward to fully evaluating Take On Helicopters when it is out-of-beta, in final release “gold”, and hopefully with a more complete dynamics package.